Experience the thrill of being part of a mob with the new Reel Steal slot game. If you ever wanted to play a game where you run a gang, steal money and run away from the law, Reel Steal slot is perfect for you. Reel Steal is quite an impressive and player-friendly slot. The game has a spectacular mob theme, advancingly colourful graphics and it comes with very lucrative bonuses. Reel Steal is a creation of giant tech company NetEnt, therefore, you can expect the game to be safe, fair, fun and exciting. NetEnt’s Reel Steal offers you a chance to join the underworld of criminals in New York City. The colourful graphics, exhilarating bad-guy scenes, captivating costumes and powerful weapons, make Reel Steal an action-packed slot. The friendly user-interface combines with the godfather-like background music to give slot players the ultimate Mob experience. The impressive video slot is played over five reels and nine pay lines. While the minimum bet is £0.01, the maximum stake allowed is £45.00. The slot also comes with a favourable RTP (return to player) rate of 95.90%. Therefore, you can expect to have about 95% of your bet back, in form of winnings. The symbols and the characters of the game are related to a heist and an electrifying police chase. As the game starts, you will be given a gun, blueprints, a camera with a map attached to it, a yellow bag full of cash notes, a suitcase full of diamonds, a safe full of gold items, fake passports and keys for your getaway vehicle. Character symbols include the boss smoking on his giant cigar, three huge and armed guys and a female criminal in sunglasses. The car is the wild symbol in Reel Steal Slot and thus substitutes any other symbol on the reel. In base games, winning Paylines that contain a Wild is worth 5X. Reel Steel slots also come with Free Spins. Earn your fifteen, twenty and twenty-five Free Spins when you get three, four or five scatter symbols respectively. Any wins made from Free Spins must meet a 5x multiplier. However, a wild in the winning line attracts a 25x multiplier. Earn extra Free Spins by landing as many Scatters as possible. 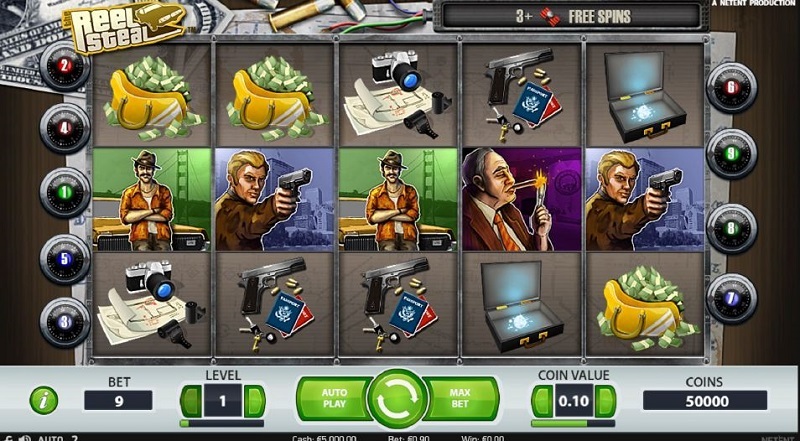 Try the Reel Steal slot now to get a taste of the gang world and bad guys.